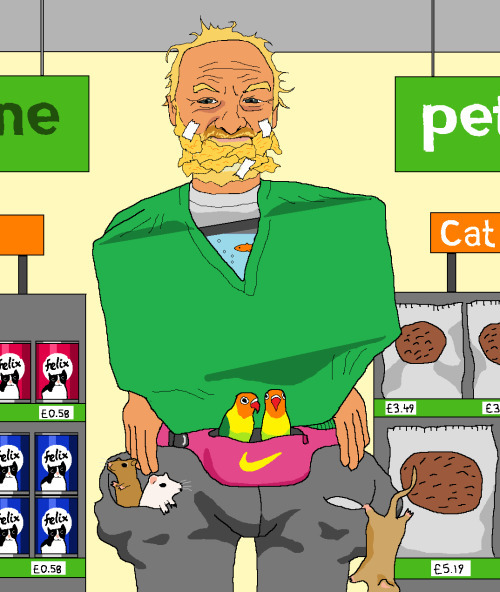 Please paint me Anthony Worrall Thompson making an absolutely pathetic attempt at shoplifting in Pets at Home. He’s trying to conceal a fishtank under his jumper, a pair of love birds in his Nike bum-bag and there are gerbils spilling out of his pockets. His poorly thought through disguise consists only of a beard fashioned from orange coloured hamster bedding. His expression should reflect a sense of exasperation at his own stupidity as he realises that he already had a real beard of the exact same colour to begin with. That takes some vivid imagination to come up with that request!